The ZCG investigations examined how subtle changes in the chemical formulation affected nucleation and growth of zeolite crystals. The microgravity environment allowed researchers to grow higher-quality crystals. These crystals have a number of useful commercial applications as catalysts and absorbents. The following content was provided by Albert Sacco, Jr., Ph.D., and is maintained in a database by the ISS Program Science Office. ZCG has been performed successfully on STS-50, STS-57 and STS-73. Unfortunately due to the loss of Space Shuttle Columbia (STS-107) during re-entry into Earth’s atmosphere, the ZCG samples processed on STS-107 were not available for processing. This investigation examined how microgravity affects formation and growth of zeolite/zeotype crystals. The three-dimensional structure of a zeolite crystal allows it to act as a molecular sieve to selectively filter certain chemicals in applications such as petroleum processing. ZCG furnace provided larger zeolite crystals with fewer defects to characterize their structures, establish structure property relationship, and better understand their sorption, ion exchange, and catalytic performance in order to design new and better materials for use in traditional as well as new applications. Zeolites are hydrated aluminosilicate minerals, with a micro-porous crystalline framework that includes a network of interconnected tunnels, creating a structure similar to a honeycomb. A sort of mineral sponge, their microporous structure enables zeolites to very specifically absorb and release chemical species, including various cations and gas molecules such as H2O, CO2, N2, Freon, and more. Zeolites and zeotypes (similar microporous silicates ) are widely used for many critical industrial processes, such as commercial ion exchangers, adsorbents, and catalysts. For example, virtually all the world’s gasoline is produced or upgraded using zeolites. In a very different application, zeotype ETS titanosilicates contain natural quantum wires in their structures, which are of great potential in electronic and optical applications and in photochemistry. However, scientists have insufficient understanding of how zeolite and zeotype materials grow, and how the desirable aspects of their porous structure (size, morphology, purity) can be controlled during crystal growth for commercial applications. The ZCG experiment examined the growth of zeolite crystals in microgravity, where the role of convection and sedimentation is minimized, providing a growth environment that would produce fewer crystal defects. The Zeolite Crystal Growth (ZCG) furnace, which was derived from earlier shuttle models, can grow zeolites, zeotype titanosilicate materials, ferroelectrics, and silver halides—all materials of commercial interest. The unit consists of a cylinder-shaped furnace, the Improved Zeolite Electronic Control System (IZECS), which includes a touchpad and data display as well as autoclaves. Two precursor growth solutions are placed into each autoclave, which mix during their stay in the furnace. Zeolite Beta was grown from precursor solutions of sodium aluminate and colloidal silica heated to 403 K (130°C) on station. The samples were characterized by X-ray diffraction to determine the crystal structure. The performance of zeolite Beta as a Lewis acid catalyst was evaluated using a standard set of chemical reduction reactions known as the Meerwein-Pohhdorf-Verley (MPV) reactions. Multifunctional Titanosilicates may be used for Absorbtion/Separation of Carbon Dioxide and Water for Portable Life Support System (PLSS) A lightweight fully regenerative water/carbon dioxide separator is a necessity for long duration, deep space exploration. One critical component is a regenerative water/carbon dioxide separator that can capture the water for recovery, and either capture and recover the carbon dioxide or vent it to a low pressure environment (i.e., Mars). Titanosilicates can be adjusted both with respect to size and shape, and with respect to pore size. These have been used commercially to separate water and carbon dioxide. By varying size and shape the pressure drop is minimized, while variations in the pore size for a given structure allows the customization of these high surface area (~500 m2/g) adsorbents. As a potential added benefit, the constituents to make titanosilicates can be obtained on the lunar surface from ilmenite (iron titanium oxide which crystallizes in igneous rocks out of magma in the bottom layers) reduction and silicates (compound of silicon and oxygen). The three-dimensional structure of a zeolite crystal allows it to act as a sieve to selectively filter certain chemicals in applications such as petroleum processing. Larger crystals allow researchers to better define the structure and understand how it works, with a goal of producing improved crystals on Earth. Improved zeolites may have applications in storing hydrogen fuel, reduction of hazardous by-products from chemical processing, and more efficient techniques for petroleum processing. Zeotype ETS titanosilicate crystals contain linear, monatomic…Ti-O-Ti-O-Ti chains that can behave as quantum wires. Improved ETS crystals with controlled morphology and size, minimal intergrowth, and fewer lattice defects would have greater potential for quantum wire applications. Thus, improved ETS crystals are of great potential in electronic, optical and sensor applications, and in photochemistry. Zeolite and zeotype materials have great potential for commercial applications. Their shapes form complex, open frameworks that act as absorbents or filters, and they can be used in diverse ways: as absorbents for oil spills; to control household odors; to filter ammonia from municipal wastewater; and as a growth medium for hydroponic horticulture. They have been suggested as nuclear waste scavengers and quantum confinement hosts for semiconductor materials. Arrays of natural quantum wires in ETS titanosilicates may find applications in thermoelectric and photovoltaic devices. The Center for Advanced Microgravity Materials Processing also is studying other uses for improved zeolites, including detergents, optical cables, gas and vapor detection for environmental monitoring and control, and chemical production techniques that significantly reduce hazardous by-products. 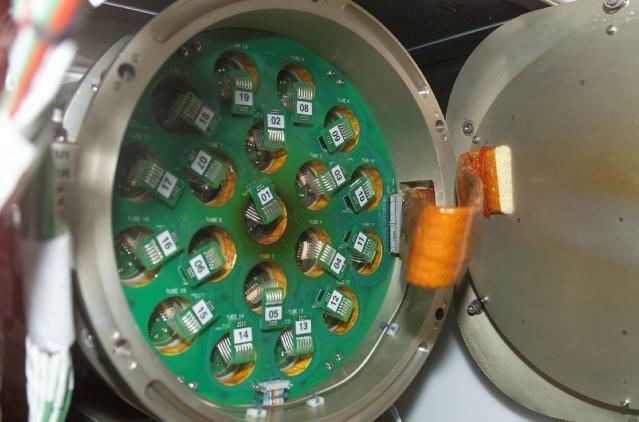 The ZCG experiments are vibration sensitive, so they are housed in EXPRESS Rack 2 (lockers 1 and 2) where they can be supported by the Active Rack Isolation System (ARIS). While the experiments are in process, the ZCG furnace requires constant power and auxiliary backup power. The unit is powered-down when the experiments are completed. Two precursor growth solutions are loaded into each metal-housed autoclave before flight. After unpacking the autoclaves, the crew spins them to force any bubbles to the center of the solution where they join into a single large bubble. This reduces the probability that bubbles will affect the crystallization. (This step, devised by Expedition 6 Commander Kenneth Bowersox, was added to standard procedures during Increment 6.) The crew performed a test mix in a clear autoclave to determine the correct mixing protocol. They recorded their findings into the IZECS, which located on a mounting plate in the EXPRESS Rack and connected to the Furnace unit. IZECS used the data to mix the solutions, powered by a motor fitted to the autoclaves. After the solutions are mixed, the furnace started to heat the samples. Crystallization occured over several hours. Using the IZECS front touch pad, the crew monitored autoclave tubes 1, 7, 8, and 19, and recorded the data in a log. Data is also downloaded from the IZECS, via the EXPRESS Rack, to the Station computer, and then downloaded to the ground-based research team. The duration of the processing is dependent upon the sample solution. Once processing is complete the samples will be allowed to cool to touch temperature, unloaded from the furnace and stowed. After ZCG autoclaves were returned to Earth, the investigators used X-ray crystallographic techniques, field emission scanning and/or transmission electron microscopy, atomic force microscopy, thermal analysis, elemental analysis, infrared and/or Raman spectroscopy, particle size analysis techniques, temperature programmed desorption of ammonia, and catalytic test reactions to analyze the crystals. ZCG produced zeolite crystals with a high degree of crystalline perfection in microgravity. During ISS Expedition 6, 19 zeolite samples were mixed and incubated. These samples were returned to Earth at the conclusion of Expedition 6 and sent back to the principal investigator for analysis. Results from the samples mixed on ISS suggest that the Lewis acid catalytic sites are altered in microgravity, as indicated by lower catalytic activity in the MPV probe reaction compared to Earth-grown zeolite. This further suggests that the control of fluid dynamics during crystallization may be important in making better industrial catalysts. Although space-grown zeolites had the same particle morphology and identical surface framework as zeolites grown on Earth, the average zeolite size of the space-grown crystals was 10% larger than crystals grown on Earth (Akata et al. 2004). Akata B, Goodrich TL, Ziemer KS, Sacco, Jr. A. The catalytic activity of space versus terrestrial synthesized zeolite Beta catalysts in the Meerwein Ponndorf Verley Reactions: Support for PFAL as the Lewis active site for cis-alcohol selectivity. Microgravity Science and Technology. 2007 June; 19(2): 5-11. DOI: 10.1007/BF02911862. Akata B, Yilmaz B, Jirapongphan SS, Warzywoda J, Sacco, Jr. A. Characterization of zeolite Beta grown in microgravity. Microporous and Mesoporous Materials. 2004 Jun; 71(1-3): 1-9. DOI: 10.1016/j.micromeso.2004.03.012. Corma A, Diaz-Cabanas MJ, Martinez-Triguero J, Rey F, Rius J. A large-cavity zeolite with wide pore windows and potential as an oil refining catalyst. Nature. 2002; 418(6897): 514-517. Seo JS, Whang D, Lee H, Jun SI, Oh J, Jeon YJ, Kim K. A homochiral metal-organic porous material for enantioselective separation and catalysis. Nature. 2000; 404(6781): 982-986. Fenoglio I, Croce A, DiRenzo F, Tiozzo R, Fubini B. Pure-silica zeolites (Porosils) as model solids for the evaluation of the physicochemical features determining silica toxicity to macrophages. Chemical Research in Toxicology. 2000; 13(6): 489-500. Coker EN, Jansen JC, Martens JA, Jacobs PA, DiRenzo F, Fajula F, Sacco, Jr. A. The synthesis of zeolites under microgravity conditions: a review. Microporous and Mesoporous Materials. 1998 Jul; 23(1-2): 119-136. DOI: 10.1016/S1387-1811(98)00046-8. Akata B, Warzywoda J, Sacco, Jr. A. Gas phase Meerwein-Ponndorf-Verley reaction: Correlation of the 3665 cm-1 IR band with the cis-alcohol selectivity. Journal of Catalysis. 2004 Mar; 222(2): 397-403. DOI: 10.1016/j.jcat.2003.11.008. Manning MP, Miller RP, McLaughlin G, Sacco, Sr. A, Akata B, Bazzana S, Jirapongphan SS, Mendoza AM, Yilmaz B, Warzywoda J, Sacco, Jr. A. Zeolite Crystal Growth on the International Space Station. Studies in Surface Science and Catalysis. 2004; 154(A): 147-154. DOI: 10.1016/S0167-2991(04)80795-X. Warzywoda J, Nurcan B, Sacco, Jr. A. Synthesis of large zeolite X crystals. Journal of Crystal Growth. 1999 Aug; 204(4): 539-541. DOI: 10.1016/S0022-0248(99)00235-3. Coker EN, Jansen JC, DiRenzo F, Fajula F, Martens JA, Jacobs PA, Sacco, Jr. A. Zeolite ZSM-5 synthesized in space: catalysts with reduced external surface activity. Microporous and Mesoporous Materials. 2001 Aug; 46(2-3): 223-236. DOI: 10.1016/S1387-1811(01)00298-0. NASA Image: ISS005E19042 – This is a view of the Zeolite Crystal Growth (ZCG) experiment as part of EXpediting the PRocess of Experiments to the Space Station (EXPRESS) Rack 2 located in the U.S. Laboratory. The image was taken by an Expedition Five crewmember. 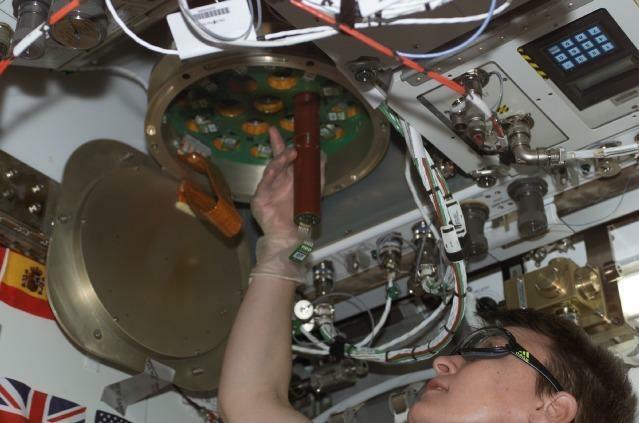 NASA Image: ISS005E19055 – View of Astronaut Peggy Whitson, Expedition Five Flight Engineer, as she places a cartridge into the Zeolite Crystal Growth (ZCG) experiment located in the U.S. Laboratory/Destiny on ISS. Scanning Electron Microscopy image of flight (a) and Earth (b) control zeolite crystals.